I stayed here for 6 days as I was attending a conference in a nearby university. The hotel is accessible via Metro Train and Taxi. The food was standard, but hope they served more rice or Asian dishes. The staff were very attentive and friendly. Just hope they had a pool. Will stay here again. If you need to be close to Knowledge village or DMC, this hotel is the best choice. 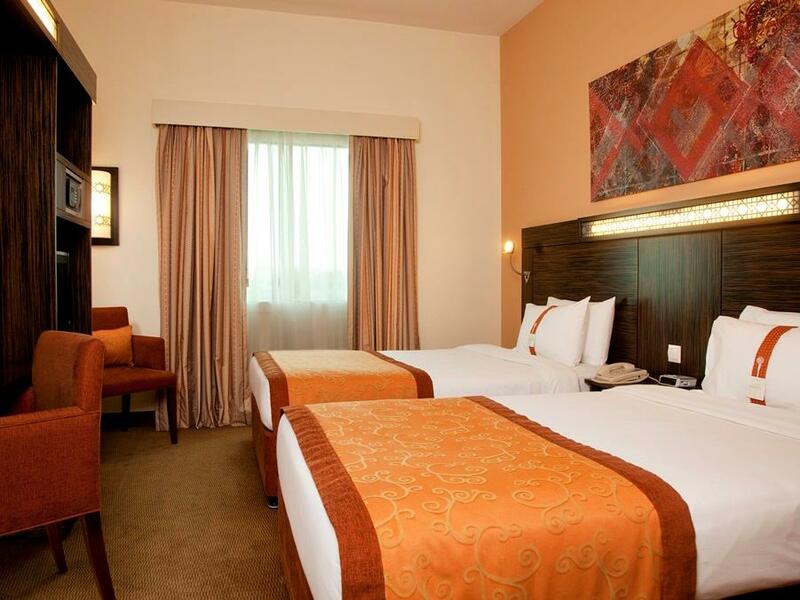 Big rooms with professional services and hospitality. In addition to the great value, the hotel includes great breakfast wit wide variety of buffets. Worth the money you spend. The free shuttle is timed and may not be available unless confirmed in advance but we took the taxi the nearby place where the minimum fare is 10 dirams if you take the normal taxi but if you take a hotel arranged taxi they charge you 10 to 15 dirhams extra for a ride worth 60 dihrams but they provide a nicer model of the car. the metro station is the internet city station is hardly half to one kilometer away. you can buy water, juice and snacks from a 24 hr kiosk at the lobby. There are 2 bars and they were empty most of the time. Staff is very friendly and supportive. Breakfast is good even they have arranged something on our request. Dinner buffet had more options anyway it is separately charged. We enjoyed the stay. It was a good experience with the hotel, I liked that the room I stayed in was fully accessible for persons with disabilities, all facilities were adaptive especially the toilet. Staff were friendly and helpful. We needed a hotel for one night while attending a function. The holiday inn express was ideal for our needs. Check in was quick and efficient, free parking in a secure underground area and a very good breakfast were above our expectations. The stay is for work purposes. Nothing exception around except 10mins walking distance away where you find some life and the subway stn. Nothing spectacular. Worth the price for a clean bed to sleep with breakfast included. 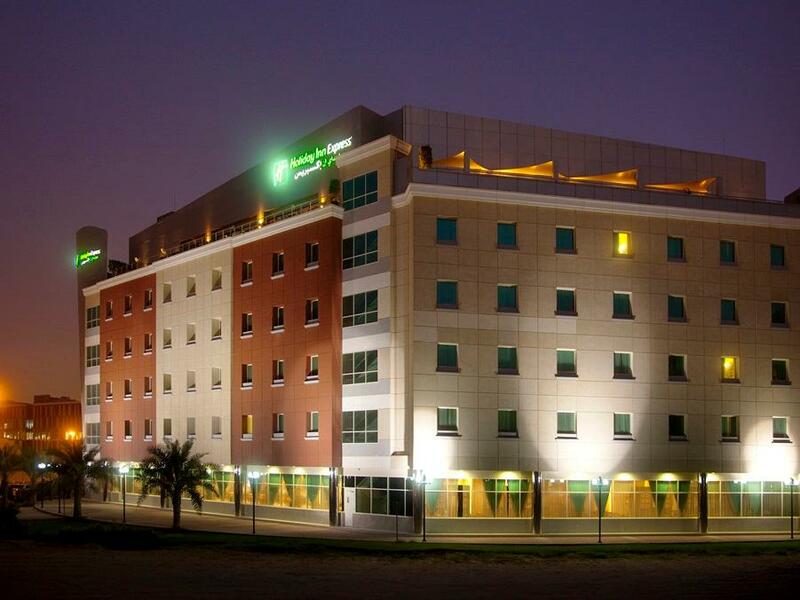 I enjoyed my stay at the Holiday Inn Express - Internet City while visiting Dubai. I have stayed at other hotels closer to the airport, but this time was looking for something different. Very close to the metro stop and was able to extensively use the metro instead of cabs to get around. Will definitely use this location again!! The hotel is located to a business area, it was quiet and private. It was a bit expensive though considering that there isn't even a pool and with only one restaurant. It was clean, however the rooms are very small. Comfortable. Accomodating staff. Georgeous room! I would recommend this hotel to anyone visiting in Knowledge Village and taking their exams in Prometrics... you may not be in the "thick" of the city... but everything is close enough by...put on your walking shoes and see the sites... Will definitely choose to stay here again.... Looking forward to see this place for another vacation! Greeted by super friendly staff on the first day. Hotel room was pretty big and clean just that the air-con was a bit noisy. Breakfast was good.Subway, Domino Pizza nearby, very convenient if you are lazy to drive out. Clean hotel. Polite and attentive staff. The buffet breakfast is quite nice. If you're doing anything at the Dubai Knowledge Village this is the place to stay. Very close. Great rooftop bar! Big drawback - lack of "local" restaurants in the area. There are some: Subway, Dominos - but nothing like to "local" flavor of small restaurants you find in Dubai proper. If you're looking for a quite place to stay close to KV - recommended. 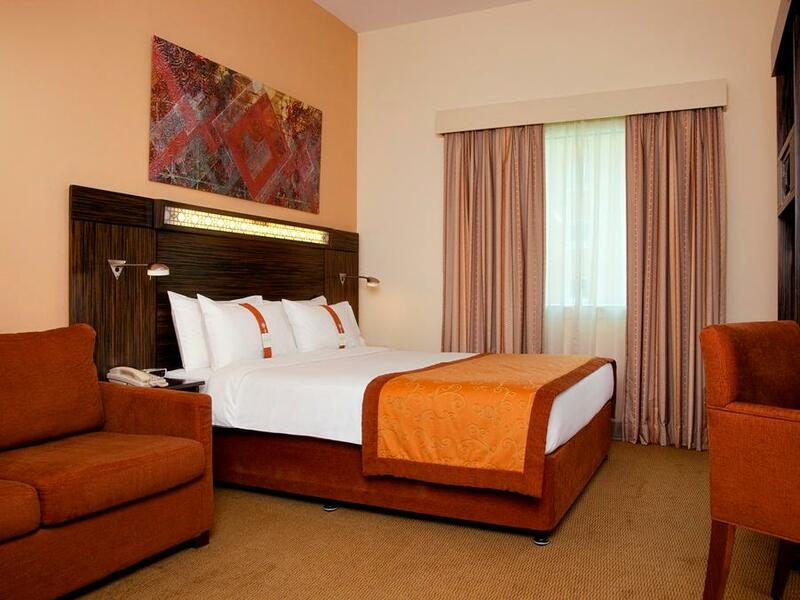 This is a good hotel that is 10 mins walk to the Internet City Metro Station and 6 stations from the Dubai Mall. They also have a shuttle bus running to Mall of Emirates which is 2 metro station away from Internet City. It is a budget hotel, and doesn't claim to be more. It was comfortable and served its purpose. Furniture is also budget and the tvs are the old box style (haven't seen those for a while!). Not many English satellite tv channels. Friendly and helpful hotel staff. If I need to be in this location again, I will certainly use this hotel again. the purpose was fully served. i wanted to visit a few places in dubai marina and holiday inn express was perfect. very close to the location with best price. breakfast was great and the service from staff was very good and they always had a smiling face to assist you. สถานีรถไฟใต้ดิน Dubai Internet City - ระยะ 0.75 กม.